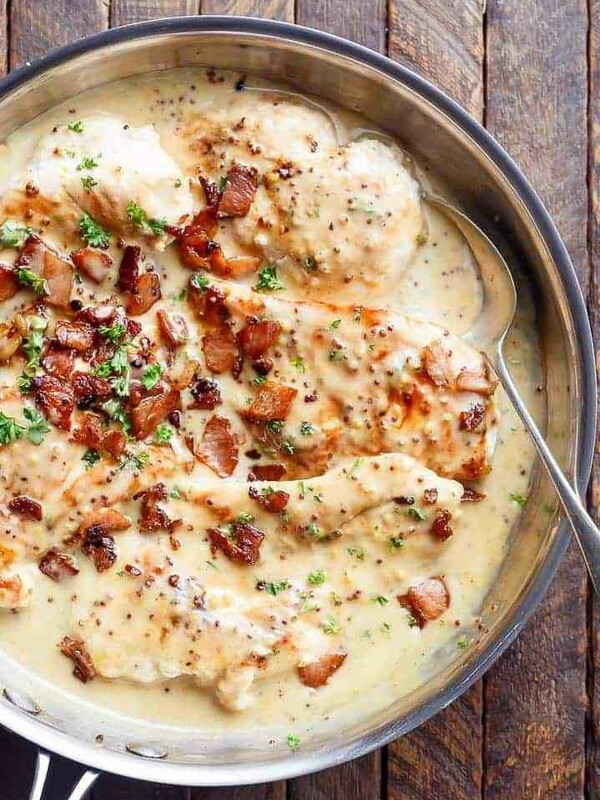 A deliciously Creamy Honey Mustard Chicken with crispy bacon pieces will become your new favourite dinner !! Sweet and creamy honey mustard sauce that takes LESS than 5 minutes to pull together, with minimal ingredients and maximum taste. This is all about that simple quick flavour. It’s an unconditional love type situation I have with honey mustard. But then there’s THIS creamy honey mustard that compares to nothing else. The sauce will have you weak at the knees, drinking it straight from the pan and good luck to anyone else that’s too slow not to come up with that idea first because now there’s none left. A deliciously Creamy Honey Mustard Chicken with crispy bacon pieces will become your new favourite dinner, with dairy free options! In a large, shallow dish, combine the honey, mustard, garlic, oil and salt to taste (not too much salt if serving with bacon as the bacon will add a salty flavour when served). Coat chicken evenly in the sauce. Set aside. Heat a nonstick pan (or skillet) over medium heat. Fry bacon until crispy; transfer to a plate. To the same pan, sear chicken fillets on each side in the oil left over from the bacon until just beginning to brown (about 3 minutes per side -- not completely cooked through as we will finish them in the sauce). Add any remaining honey mustard sauce into the pan along with the cream and milk. Bring to a simmer while stirring occasionally to mix the favours through the sauce (about 3 minutes), until the chicken is cooked through. Transfer the chicken to a warm plate. Pour the cornstarch mixture into the centre of the pan, mixing it through the sauce until it thickens. Place chicken back into the pan; coat with the sauce. Top with the bacon and garnish with parsley. Serve over steamed / roasted vegetables for lower cal options. Also great with pasta, rice or mashed potatoes!